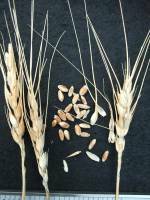 April Bearded is one of the few wheats for Spring and in particular late Spring sowing in the British Isles tradition. 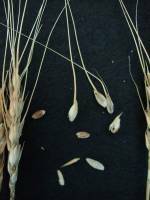 It is also one of the few wheats to continue in common cultivation from the mid 19th C up until the advent of modern dwarfed wheat in the 1950s almost certainly because of its fairly unique ability to ripen from a late sowing. Listed as a good baking wheat by Peachey in "Cereal Varieties in Great Britain", 1951. There are Welsh and English versions, the English version being slightly stronger plant. 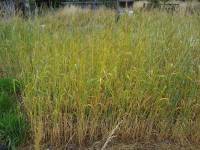 April Bearded varies greatly in yield, grains per ear, strength of straw and height of plant according to the date of sowing and fertility of soil. 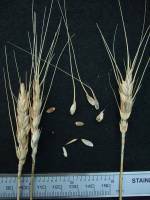 "In common with many modern agriculturists, I at one time entertained a dislike to bearded wheats, believing that such varieties produced inferior grains; but after my experience of 1857, and tho following year, when a red as well as a white bearded wheat respectively yielded the finest grains in tho collection which I had grown under a parity of circumstances, the error regarding this appendage became obvious. 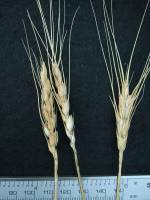 The beard or awn of wheat is unlike that of barley, being attached to the outor palere, or chaff, and not to the skin of the grain. The beard also projects from the ear at an angle varying from 40 to 50 degrees, and its strength and elasticity, which are both considerable, are neither, much impaired by wind or moisture. 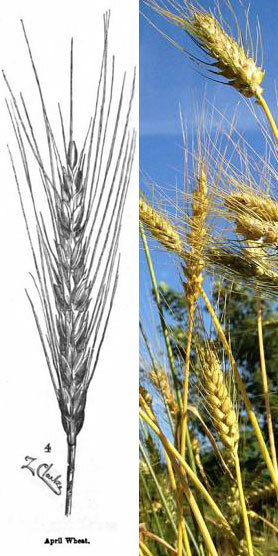 When the crop is driven to and fro by the violence of the wind, the spring of the beard lessens the shocks of the ears, and prevents the corns at the apex being shed, which is so common with beardless varieties. The elasticity of the beard also tends to promote a circulation of air in the bound sheaf, thereby retarding the sprouting of the grains in wet seasons, and, hastening the hardening of them in fine weather. 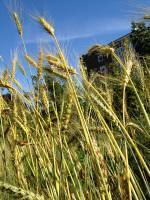 Under no circumstances is the beard injurious to the wheat-plant; and in the fickle climate of Scotland it is found to be a valuable appendage."" "Spring wheats may be sown this month on any land adapted to them, either clover lea which has not been ploughed in time for an earlier sowing, or land which has borne a green crop — either pulled and carried away or fed on the land by sheep. 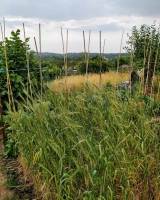 The Talavera wheat is one of the best for sowing at this time — though almost any of the sorts usually sown in autumn will do very well. 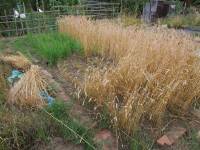 Later in the season the so called April wheat, a red-bearded sort, is alone fit for use as seed, and a description of it will accordingly be given next month."